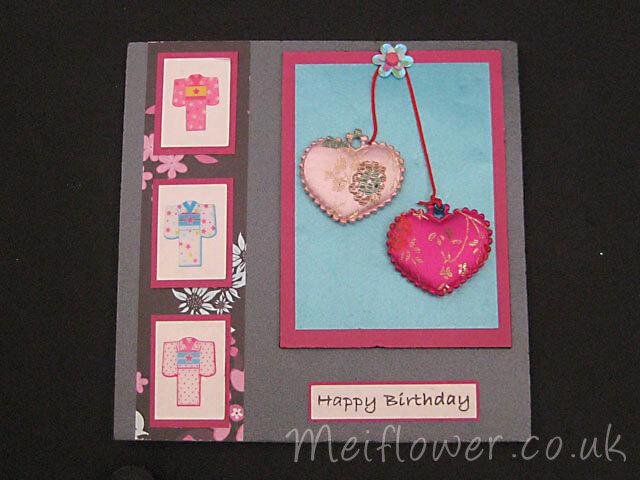 Happy Birthday With Oriental Theme. 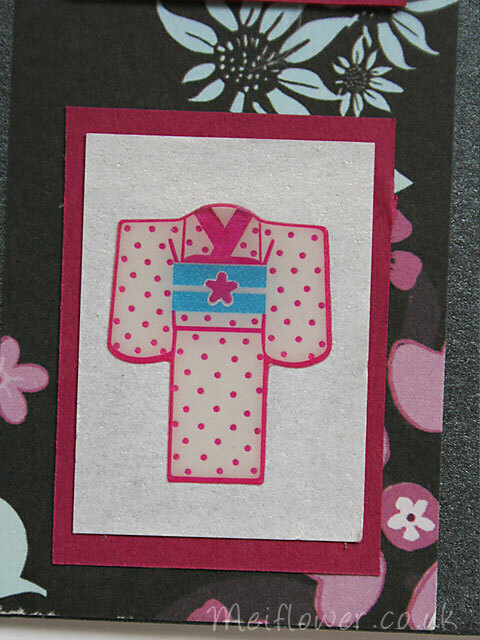 Finished Card Size – 14.7 x 14.7 cm square. - Stick the 8.1 x 11.1 cm cerise paper on to the black funky foam. Stick the torquise 7.1 x 9.4 cm piece of paper on top of the cerise paper as shown. - Layer 1 Daisy Sequin Flower onto a 6 Petal Flower Sequin and attach to cerise and torquise piece from above with cerise brad. Stick onto the black base card. - Stick 2 Oriental Hearts onto the torquise paper, stagger them. - Cut a piece of Oriental Red Cord appoximately 15cm. 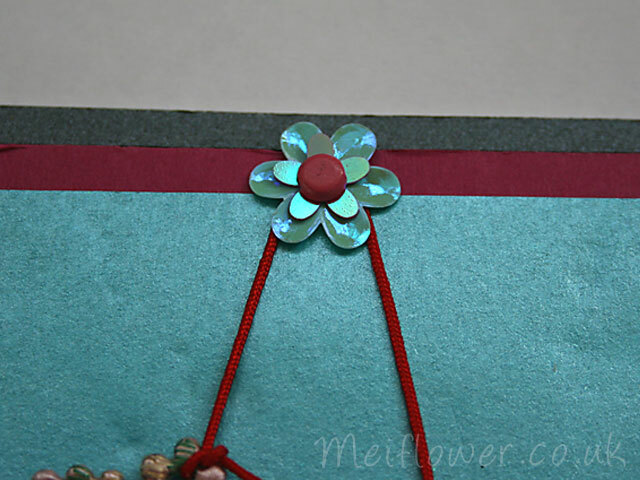 From the middle of the cord, tie around the sequin flowers. 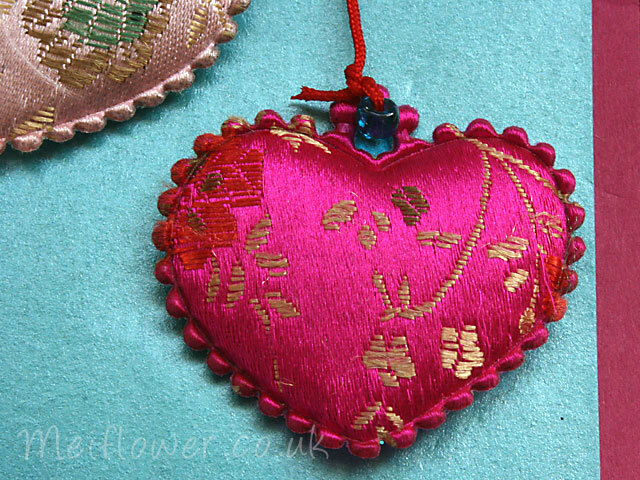 Tie the ends of the red cord into the holes of the oriental hearts. Cut excess string off. - Matt and layer white pearlescent strip of paper 5.8 x 1.2 cm with the cerise strip of paper 6 x 1.9 cm. Stamp Happy Birthday onto the strip. Stick onto black base card. 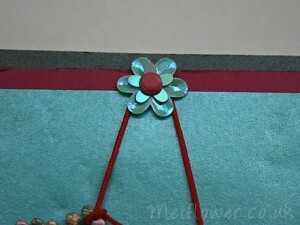 - Stick floral strip left hand side of black base card. - Matt and layer 3 x Cerise paper 2.8 x 4 cm with the 3 x Pearlescent white paper 2.5 x 3.5 cm. 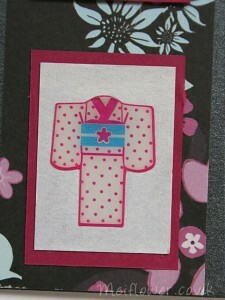 Select 3 large Kimonos to stick in the middle of the 3 pearlescent rectangles. Stick onto the floral piece, evenly spaced out. Testing testing, one two testing . . . . . just making sure it works i am not very computer literate, lol! So . . . busy at the moment with craft shows. Tommorow we are off to do a show in Leigh, have to get up at 5:00 in the morning – hope its not going to be cold. 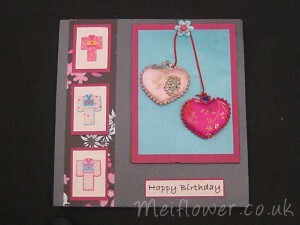 Lots of our regular customers who buy from MeiFlower at the shows ask me to show them how to make my card samples. So i thought i would start putting them on a blog where it would be easier for me to share my ideas and thoughts with everybody.